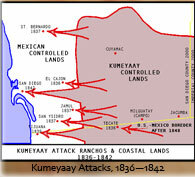 Click on Kumeyaay map thumbnails for larger picture. 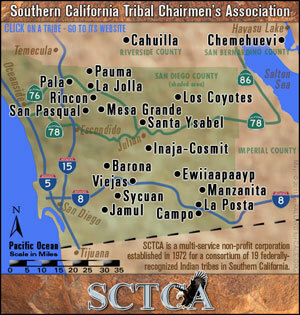 The Mike Connolly Miskwish San Diego County historical tribal Kumeyaay mapping projects are featured in the Campo-kumeyaay History section and detail Indian history tribal homelands and facts about Southern California first nations of desert, mountain, coastal, river Indians and how today's current California Indian reservations were established in southwest United States. 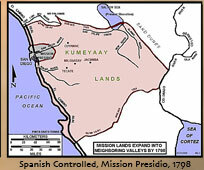 Mike Connolly Miskwish, Campo Kumeyaay Map details all the 2005 Indigenous Southern California Indian tribes, the Native American Indian reservations rancherias ranchos ejidos of the greater Southern California area and northern Baja California, Mexico, and contrasts them with the Indigenous Kumeyaay territory of 1769. 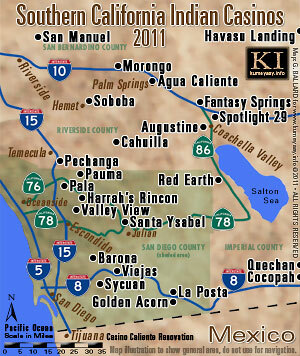 ADESU.ORG indigenous website includes a detailed satellite map that shows the US-Mexico border area including Golfo de California, Gulf of California, San Isidoro, Kiliwas, Santa Catarina, Ensenada, La Huerta, Cucapa, San Antonio Necua, San Jose de la Zorra, Juntas de Neji, Tijuana, Mexicali, Calixico, San Diego, Océano Pacifico, Pacific Ocean geographical areas from outer space topographical high-altitude planetary perspective. NOTE: The ADESU website has been deleted from the internet. HISTORICAL DIEGUENO MAP 1920s old antique map unique spellings of Mexico Diegueño Yuman tribes Mexican early 1900s, 1920s, including Jamul, San Diego, Tecate, Campo, Tijuana, Yuma, Tanama, Kwitark, Jacume, Cerro Centinela, Kamia, C. Prieto, Kwatl Kumiyai, Kwiñitl, Sierra de los Cocopas, Cocopa, C. Borrego, Rio Colorado Channel, Papago, Kwijas, Las Juntas, Niji, Agua Hechicera, El Compadre, Mishkwish, Santa Clara, Jamatay, Descanso, San Jose, Guadalupe, San Miguel, Kwatl Kumiyai, Jat'am, Agua Hervidors, Campo Nacionel, Ensenada, Santa Catalina, Sierra de la Tinaja, Sierra Pinto, Arroyo Grande, Cerro Borrego, Sierra de San Felipe, Valle de San Felipe, Sierra de San Pedro Martir, Arroyo Leon, P. del Diablo, Santo Tomos, San Vincent, San Telmo, Santa Domingo, San Pedro Martir, Juigrepa, San Quintin. 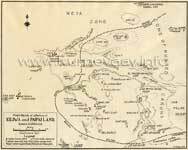 HISTORICAL KILIWA PAIPAI 1920s old antique map unique spellings of Mexico Yuman Indian tribes Mexican early 1900s, 1920s, including Mesa Zone, Valle de la Trinidad Jasi(G), Cerro Colorado Kwiniel Wey, Wey Ijt, Zone of Rugged Cañons, Cuap Wey, Chipa Wey, Arroyo Carrisito, Agua Caliente, Jacopin, Jupap Wey, Jupaja, Ucha Wey, Wey Mijak, Jewiluja Wey, Jel Jumkwinep, Colwey, San isidoro Japoknian, Isicha'a, San Antonio del Valle, Nakipa, Wey Cojo, Tuwaloniwey, Jeljumkwinep, Jewiluja Wey, El Paso de San Matias, Jeji Chuwilu, San Martias Spring Jejija, San Felepe Desert, Selewalo, Kay Kesiay, Muwa Wey, Jankilawa, Kay Sipukwin, Juigrepa, Esperanza Cañyon Cuchiwa. 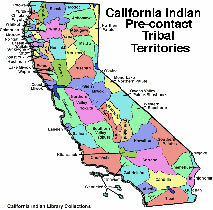 HISTORICAL PRE-CONTACT MAP of the California tribal ancestral territories (courtesy of California Indian Library Collections). 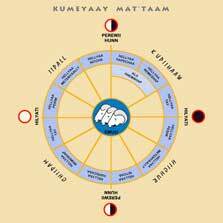 This Native American California Indian calendar is a contemporary interpretation of the traditional Kumeyaay calendar. 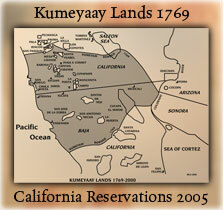 Historically, the Kumeyaay calendar was flexible and adaptive to changing conditions. 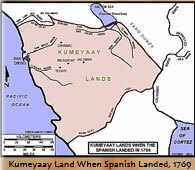 KUMEYAAY DOCUMENTARIES Indigenous peoples of California Native American Indian documentary series features SAN JOSE DE LA ZORRA Kumeyaay Indian village, Baja California, Mexico. 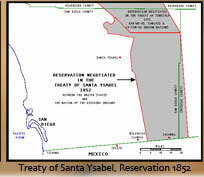 Also, SANTA CATARINA, SAN ANTONIO NECUA and JUNTAS DE NEJI. 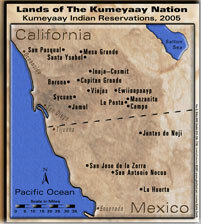 KUMEYAAY.INFO showcases the professional photography and journalistic documentation virtual tours of village inhabitants rancherias ranchos Indigenous lifestyles in the tribal ejidos of Baja, environmental portraits, habitations and pictures of their traditional California Native American arts and crafts. Los indios indígenas de las fotos documentales de la forma de vida del photojournalism de México representan películas. 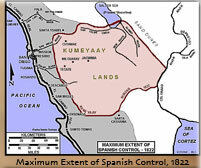 (Click HERE or on the linked page's thumbnail to enlarge map file). 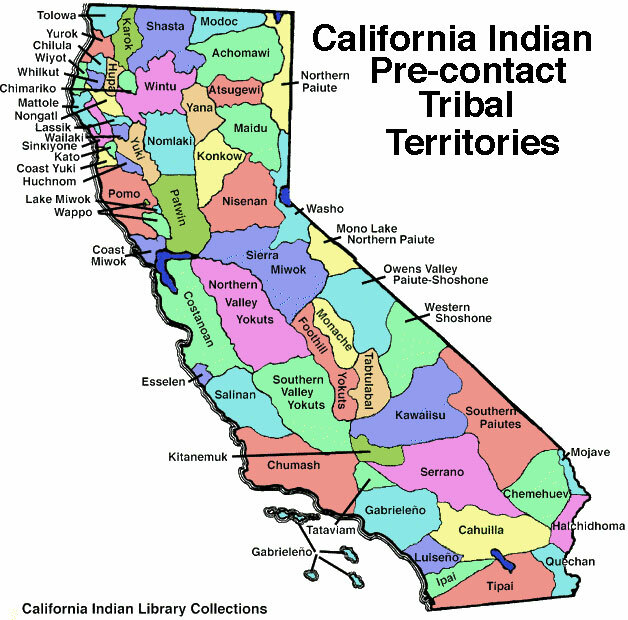 The Indians of San Diego County, DOLAN H. EARGLE JR.
"Four tribal groupings make up the indigenous Indians of San Diego County: The Kumeyaay-Diegueño, the Luiseño, the Cupeño, and the Cahuilla."